Ami Vitale shot this image in Colombia: It depicts a local initiative, which aims to plant coffee bushes and support development of sustainable farms by training local communities to use new farming techniques and by providing Internet access. The photo, along with the others in this story, were included in Lavazza’s 2019 calendar and focused on six fine-art installations that promoted environmental issues. 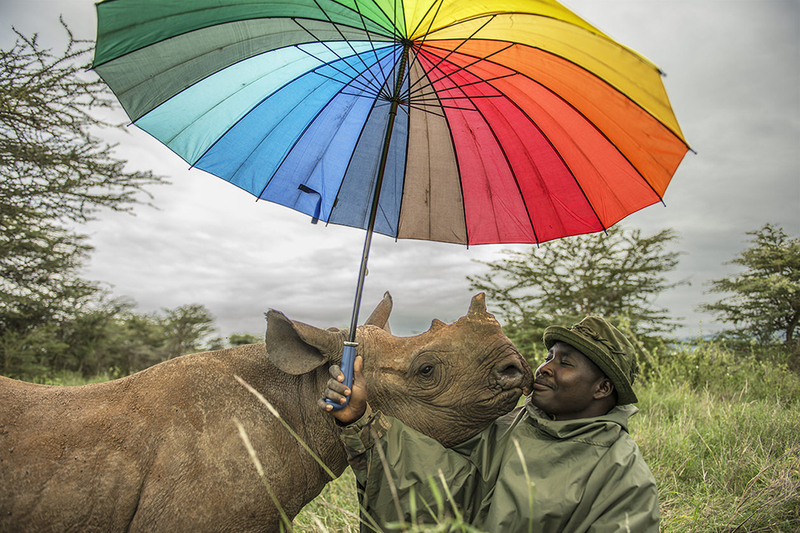 Like most National Geographic photojournalists, Ami Vitale uses her camera to produce powerful images of wildlife and the environments they inhabit. But Vitale, who is also a World Press Photo award-winner and Nikon Ambassador, doesn’t stop there. In many cases, she publishes her photography in an attempt to help save the planet. For instance, in 2009, after producing a story on the transport and release of one the world’s last northern white rhinos, Vitale shifted her focus from covering spot news in conflict zones to developing a broader range of stories focused on the environment and endangered wildlife. 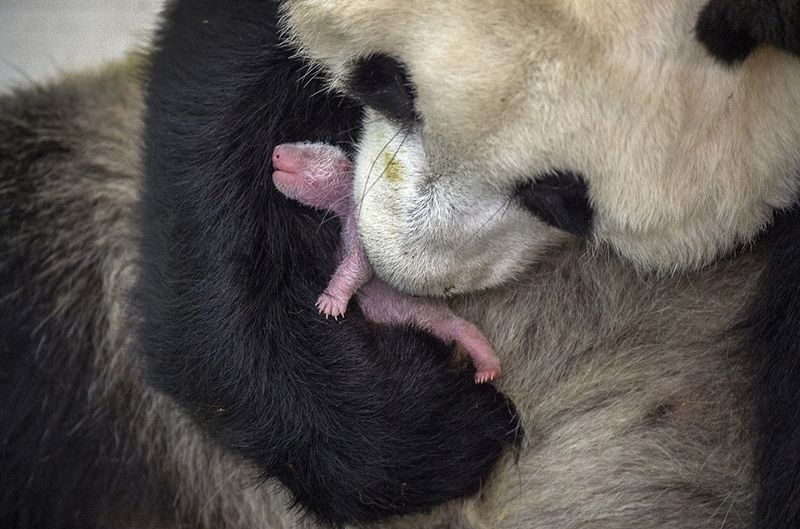 Such stories included reports on poaching in Africa and photo essays on raising pandas in China. More recently, Vitale documented the efforts of Chinese scientists and conservationists breeding pandas and releasing them into the wild in order to augment existing populations while protecting their natural habitat. It’s a body of work that resulted in a bestselling book, Panda Love: The Secret Lives of Pandas, published by Hardie Grant, which also happens to be Vitale’s first published volume of her photography. Vitale used a drone to record “Perpetual Flow” by artist Gerada, which is an installation that extends over 37,500 square meters. To produce the works for the calendar, which was developed in partnership with the United Nations Environment Programme (UNEP) and under the creative direction of the advertising agency Armando Testa, the Montana-based photographer collaborated with six different international artists to tell six stories of people committed to protecting the planet. To photograph her subjects, Vitale traveled to countries on four different continents, including Colombia, Switzerland, Kenya, Thailand, Belgium and Morocco. Digital Photo Pro: Let’s talk about your recent Lavazza project. Ami Vitale: Lavazza has been creating a prestigious calendar for more than a quarter of a century, working with the world’s top photographers, including Helmut Newton, David LaChapelle, Steve McCurry and Annie Leibovitz, among others. I was honored to follow in their footsteps, and also be the second woman, after Leibovitz, to shoot the calendar. This year’s theme was titled “Good to Earth,” and it was a collaboration using art to focus on sustainability (in particular, the 17 Sustainable Development Goals, or SDGs, of the United Nations). I had the phenomenal opportunity to work with six brilliant artists, ranging from installation artists to painters. They created sustainable artwork on different continents to tell stories where people are working to find solutions to our planet’s most pressing challenges. Even though the art installations were a part of nature, they were ephemeral, and most of them will disappear. This project, “Good to Earth,” is about collaborating and shining a light on those who are caring for the environment in all its forms—from glaciers to deserts to elephants to the tiniest of ants that inhabit the earth. Our future depends on all of them. It’s also about artists who are thinking about these seemingly insurmountable challenges and using their craft to take this message to a variety of different audiences. If more people are involved…we’ll come up with solutions. For example, one artist, Gerada, painstakingly raked small rocks in the extreme heat and dust of a desert to create a poetic picture. His work tells the story of a community overcoming the challenges of living in this extreme landscape. The work is an installation of hands holding water that spills over into the greenbelt [land in urban areas zoned to remain largely undeveloped, wild or used for agricultural purposes], where the community has turned desert into fertile land. The beauty is that the creation could only be viewed from above. “Good to Earth” is about finding stories of hope where individuals are finding solutions to our most pressing environmental challenges. 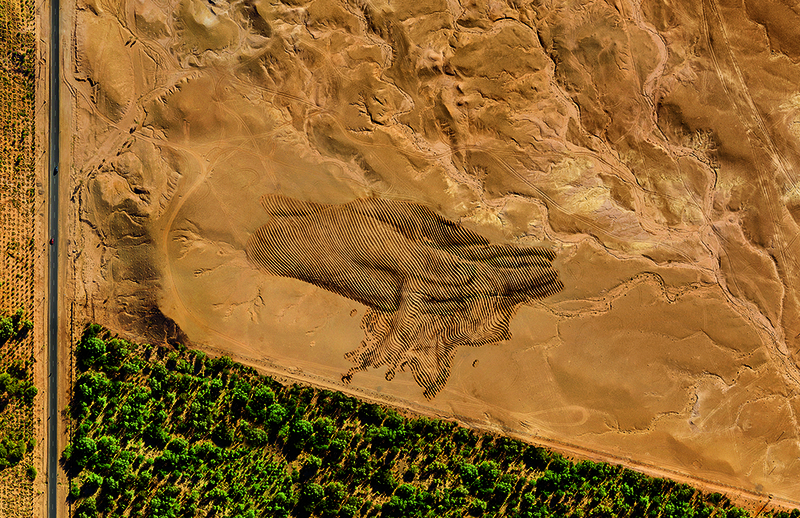 Where was that overview photo, with Gerada’s art in the sand, taken? That was in Morocco. The stories behind each of these images and the artwork are as important as the artwork and the photography itself. So the story in Morocco describes how that region has one of the most extreme and harshest landscapes on the planet, where there’s nothing for hundreds of miles except dust, sand and the blinding sun. You can’t imagine anything could survive there. But because communities have come together and managed their resources, they were able to build a greenbelt, which helps sustain a densely populated area in this crazy, extreme landscape. So for this work of art, surrounding this installation, you see the desert on one side to the north, and to the south is this greenbelt. 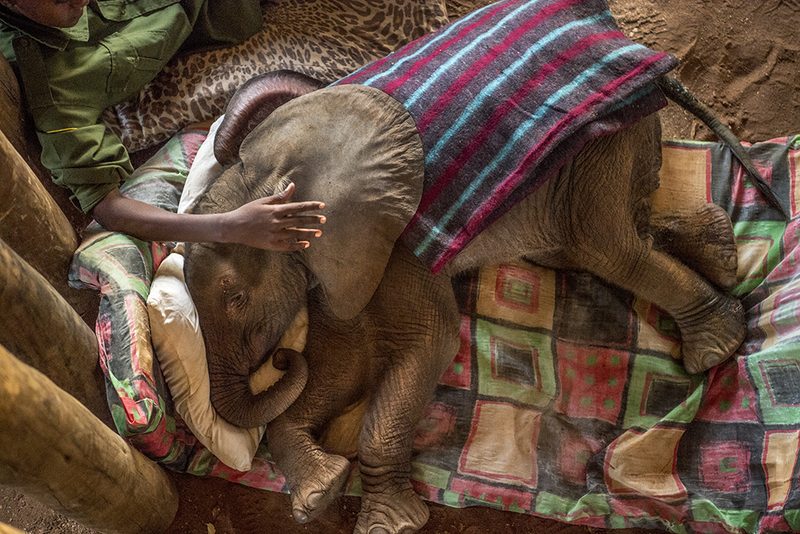 Vitale photographs Mary Lengees, one of the first indigenous Samburu women elephant keepers in Africa, caring for Suyian, an elephant rescued by the Reteti Elephant Sanctuary, the first indigenous-owned elephant sanctuary in northern Kenya. I used a drone and shot around 50 pictures that were then stitched together so you could get the scope of the whole landscape. One [challenging] part of the project was that I had to do justice to the artwork itself—to show off what the artist’s intentions were. For the second part, I needed to show the beauty of the landscape itself. The third piece was about the people and the story behind the landscape, what the story was actually about. I had to use drones to contextualize the artwork for several of the installations. Some were bigger drones where I’d use my own camera. For others, like in the case of Morocco where getting permits is pretty tricky, we used a DJI. You did another dramatic desert shot that’s the centerspread of the calendar. That’s one of my favorite images from the project. It was done in the Sahara Desert of a woman walking on this massive sand dune. A piece of this project was just looking at this really awe-inspiring planet and our extreme climates. I love the idea that even in the most remote places, the most extreme landscapes, there’s almost always a trace of humanity. So when we talk about nature, we have to talk about people. “Dendrochronology” comprises six oil paintings on Plexiglas by the artist Gomez, which are installed in Phetchaburi, Thailand. Photographers and filmmakers often frame humanity out of the picture. But the reality is: People are almost everywhere. Going forward, when we talk about a sustainable planet, we need to include people in the story, and that was part of my message throughout all of this. What are we going to do to protect these places, especially wildlife habitats? 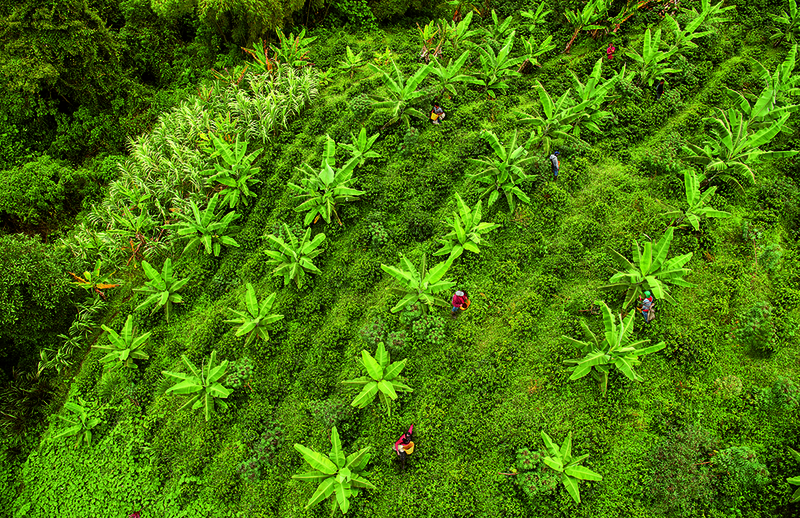 Your overhead shot of people in Colombia working in the fields is a good example of the diversity of our planet. It looks like another drone shot. I actually shot that suspended on a wire in a tiny cage that this coffee grower had made. They strung a wire across a valley between two mountains. I got into the cage because I wanted to show sustainability from above. Lavazza has a connection to Colombia, so it was showcasing this particular landscape and the story behind it. In the art that goes along with this image, there’s a portrait of a young girl portrayed on the grass in a painting by Saype that measures about 8,000 square meters. She’s using her hands to protect a coffee bush, symbolizing the desire to take care of her own future and that of the local area as a whole. What equipment did you use for this shot and the series, when you weren’t flying drones? I used the Nikon D850 for a lot of it. I had a Nikon D5 with me, as well. I also used, on occasion, Elinchrom lights for the portraits. I travel really lightly: I had my prime 24mm, a 24-70mm f/2.8, a 70-200mm f/2.8 and a reflector, and that was about it. 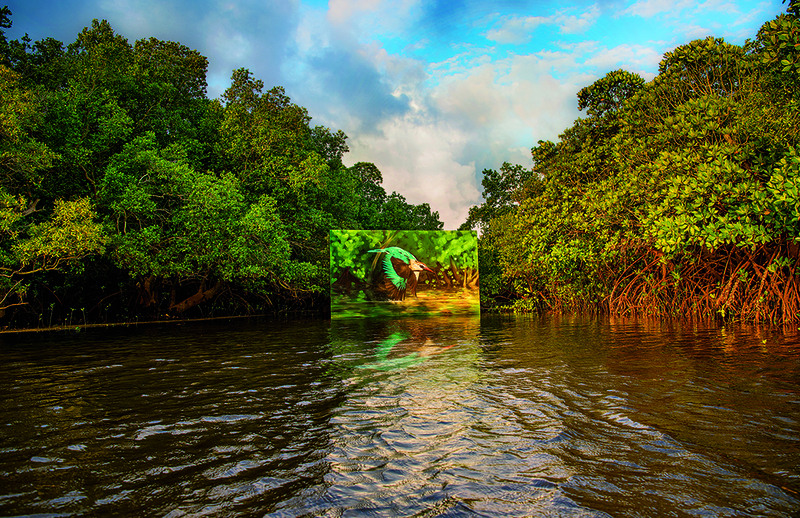 “Mvuvi wa mikoko” (mangrove kingfisher) is an acrylic painting on gessoed canvas painted by the artist Mantra and installed on a raft secured to the mangroves in Gazi Bay, Kenya, and photographed by Vitale. What’s the story behind the photorealistic multiple images of a woman in Thailand? Some people are surprised that it’s actually a painting of a person on clear Plexiglas panels done by the artist Gomez. This project is also about diversity of viewpoints. Each artist interpreted the project so differently. We scouted for a suitable location in the forest to show that she was at one with the trees and foliage in Thailand and installed the artwork. What about the Kenya shot with the huge panel with a bird painted on it? That’s a painting of a Kenyan Kingfisher. It was incredible trying to put this painting in the middle of a mangrove, which is constantly in motion, with the waters rising and falling at every moment. It was put on floaters, and we swam with it across a river. I was up to my neck in water to get the shot. The whole process of getting these pictures was quite interesting. The idea is that it becomes part of the landscape. Mantra, the artist from France who created this artwork, is actually quite special and has quite a connection with and understanding of nature. He was a naturalist and biologist first, before he became an artist. It looks like the kingfisher and the mangroves portrayed in the painting are at one with the water, fauna and forest. 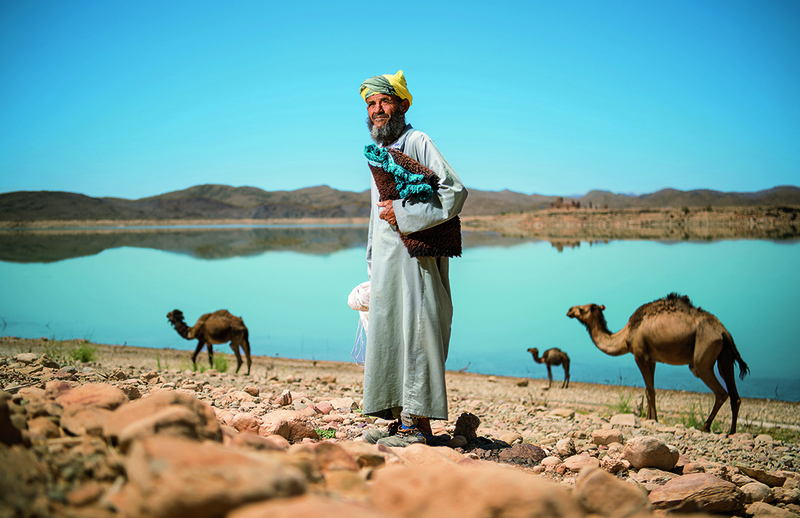 Was the dramatic environmental portrait of the man with the camels for Lavazza a collaborative effort as well? There’s nothing connected to the other artists in that shot. This was the part of the project that showed the community that has come together to live in this extreme landscape and are finding solutions to their environmental challenges. They’re using resource management technologies. He’s just one of the many people that are part of this story. A big piece of all of this messaging is that it’s very often indigenous people or people in these landscapes who become the greatest protectors of these places. The inhabitants of Ouarzazate have protected it against sandstorms by creating a greenbelt around the city that uses innovative irrigation systems. Wastewater is recycled, filtered and pumped into the greenbelt by the largest clean power plant in North Africa. Can what you do with your camera make a difference in the struggle to protect the planet and its inhabitants? One-hundred percent! This is my main message. Creativity and art and using our voices definitely makes a difference. Everyone here has the capacity to make an impact by making our voices heard. For example, China had a ban on the rhino horn and tiger trade. They had banned it, but recently the government said they were going to reverse the ban and allow rhino horns and tiger parts to be used for medicinal purposes. The worldwide response to it was swift and sharp: People talked about it, wrote about it, and it was everywhere on social media; even Chinese citizens were speaking out against it. I think within 48 hours the government decided not to reverse the ban. Messaging does matter. Using our voices does matter. I think it’s important in today’s world to not be cynical and realize our voices matter more than they ever have. The truth of the matter is very few people are actually engaged in the fate of our planet. Your giant panda project in China seems to have helped this once-endangered, now-vulnerable species. Did you come up with the idea or did National Geographic? China is doing incredible work, which we never hear about. We only hear the worst environmental stories. I pitched this story to National Geographic. They actually rejected my proposal at first, but I went back and really worked hard to show why this story was so important. I like to find stories that we think we already know about and turn them on their head. The panda is the perfect example. Who hasn’t seen a picture of a panda? They are one of the most recognizable creatures on the planet. What I discovered surprised me, and I like finding these stories that we think we know, but in actuality, there’s so much more that we didn’t. If you start digging into any story, you realize there’s always so much more to it. survival rate. But when they’re born, they arrive blind, nearly hairless, squeaky and 1/900th the size of its mother. I think that’s the secret to great storytelling. It’s not how far we travel or how exotic it is. Great storytelling is about how you tell it. “Goodbye Sudan, the World’s Last Male Northern White Rhino” is an extremely powerful story but one with a very tragic ending. The other theme of my work is like the northern white rhinos, where a species is in jeopardy of disappearing. We’re about to condemn all future generations to eternal poverty. I spent almost 10 years working with these communities in northern Kenya. So, when Sudan, the last male northern white rhino, was about to die, they called me and let me know that I should come back to say goodbye. I was the only photographer they allowed to document his final moments. I think that’s the other secret to good storytelling. It’s about committing and taking the time to go deep. 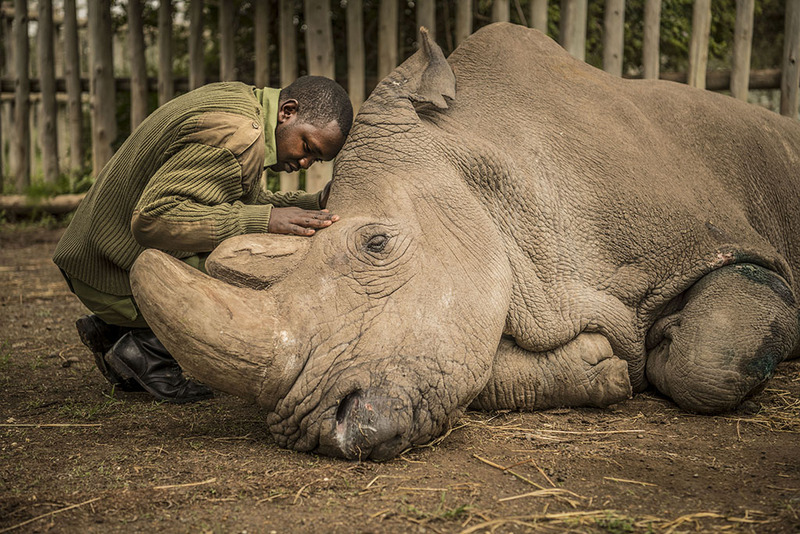 In many ways, Vitale’s photograph is both a timely and timeless one: It depicts Sudan, the last living male Northern White Rhino left on this planet being comforted by Joseph Wachira at the Ol Pejeta Conservancy moments before he passed away on March 19, 2018 in northern Kenya. Sudan was brought to Kenya from Safari Park Dvur Kralove in the Czech Republic in 2009. You’re not just parachuting in, shooting some spot news, then running off to the next hot spot. I did that at the beginning of my career and quickly realized that to truly create change, to help people understand and, more importantly, to help get them engaged, you need to spend longer than a quick news story. I think it’s been said before, but I like to make timeless images, not only timely images. For more on Ami Vitale’s work, see her website at amivitale.com.